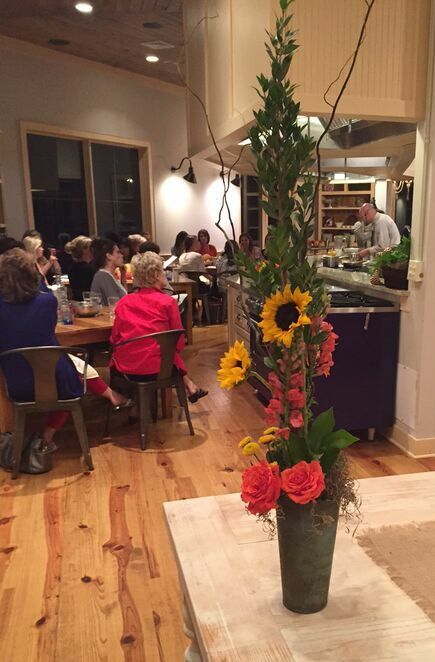 Floral Demonstration at Farmer’s Table Cooking School – Gina Diamond's Flower Co.
October 12, 2015, posted by Gina – Two weeks ago I had the pleasure of presenting floral designs at the beautiful Farmer’s Table Cooking School in Livingston, Mississippi. Livingston was the original County Seat for the area but as times changed so did the County Seat. 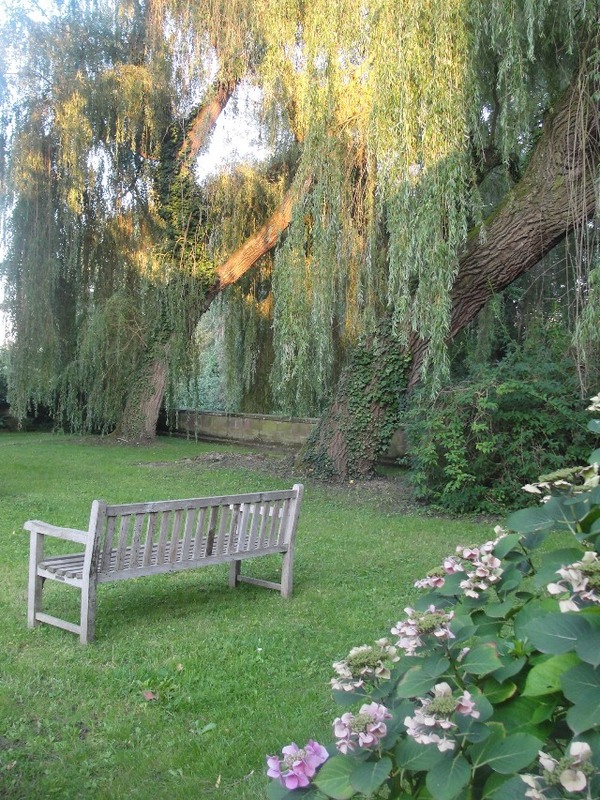 This area is dotted with beautiful fields filled with trees, a few cows and gentle, rolling hills. Even though you are just minutes from the city, you feel as though you’ve stepped back to a time when the pace was a bit slower. The Cooking School is a very nice venue where Chef Matthew teaches classes on mastering culinary skills but the school also hosts other kinds events. 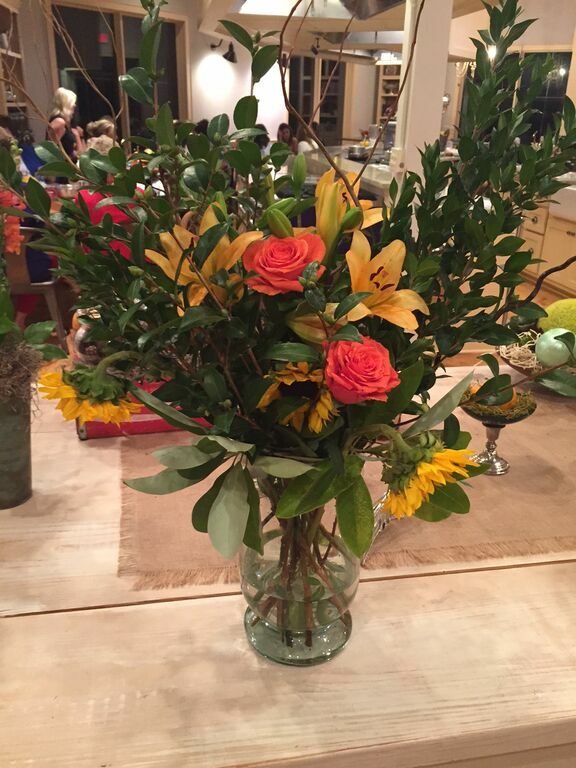 So, I was thrilled to be invited to teach a floral design class. Since it’s tailgate season, the first thing I showed was this very simple arrangement that’s super easy for a tailgate host or hostess to put together and a great way to dress up tailgate tables. 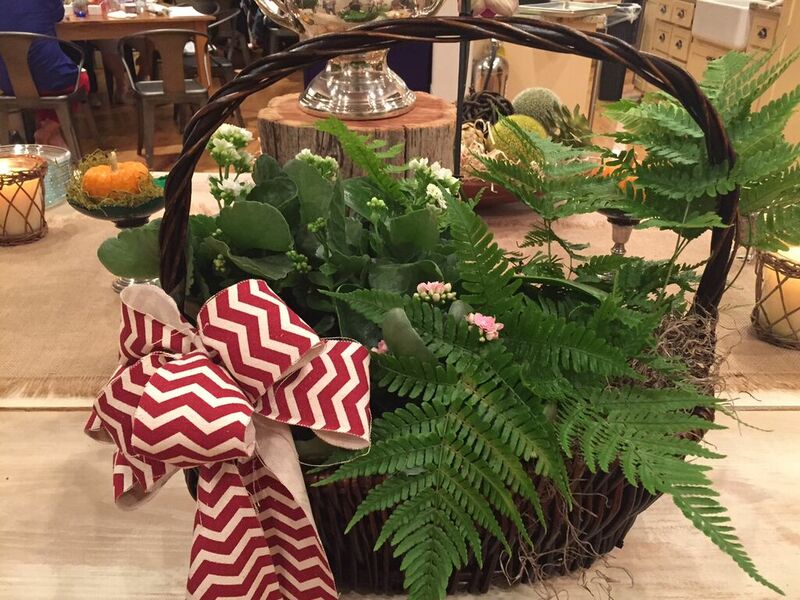 I chose this oval basket as it is the perfect size for a table. I gathered plants in school colors and created a coordinating bow. Spanish moss covers the pots the plants are in and finishes off the basket. This took about 5 – 10 minutes to assemble and is really a great alternative to a fresh flower arrangement. Bonus: The handle on the basket makes it easy to carry to your tailgate area. 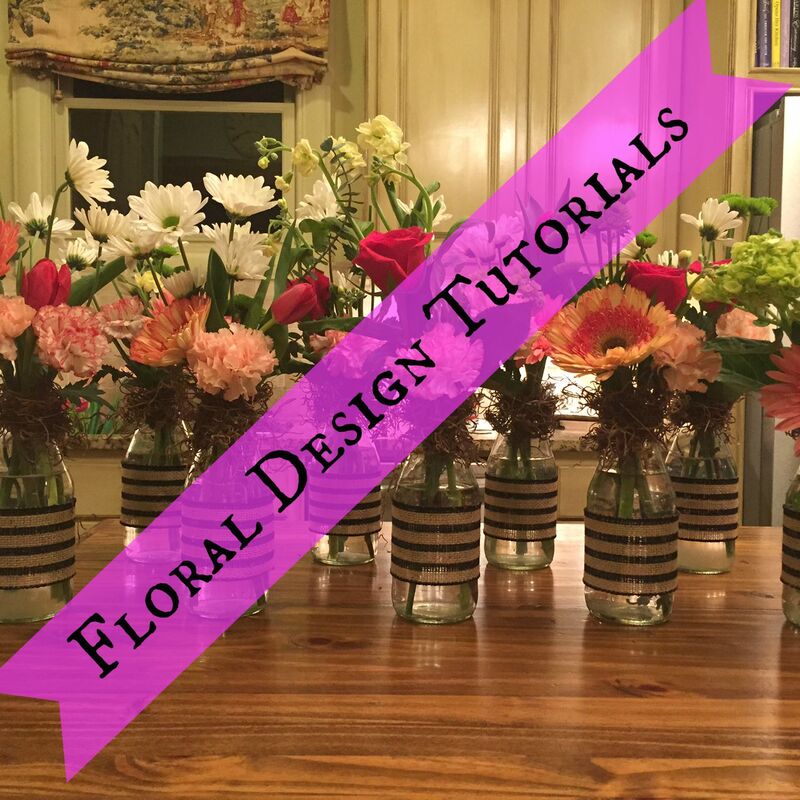 This round centerpiece is one of the most practical arrangements to make. It sits low, allowing for conversation, and does not take up too much space ensuring you have plenty of room for food. The pleasing mix of colors in this dough bowl arrangement can carry you through the season. Cover the bowl with some wood shred and then arrange coordinating colored spheres in the bowl. 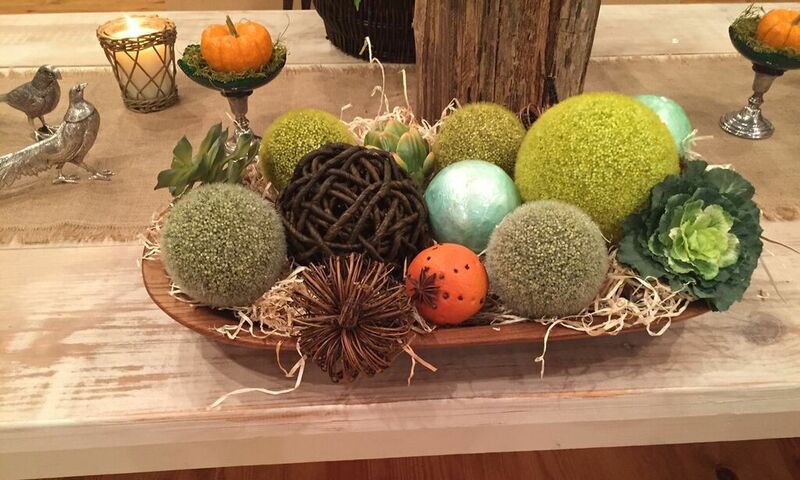 I added a touch of whimsy with an ornamental cabbage and an orange pomander ball. I like to call this lean, vertical design the “welcome” arrangement because it looks so striking in an entry way. 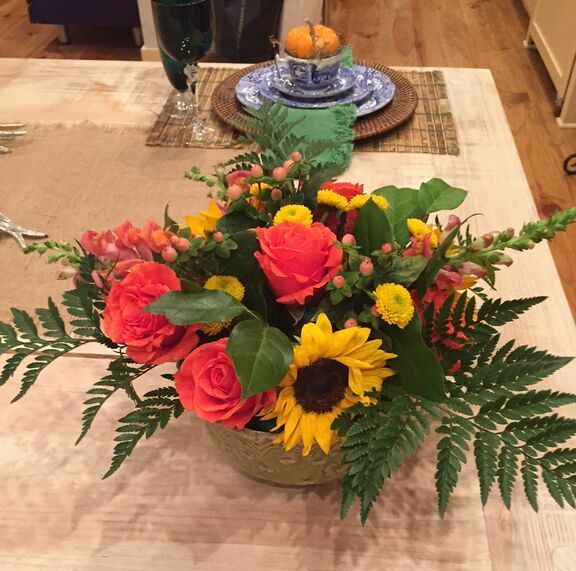 Use coordinating colors in centerpieces and arrangements throughout your home. These Coca-Cola crates were so ubiquitous in my childhood that we would literally trip over them in the garage. You’d probably have to pay about $50 for one today. They are so much fun to use for arrangements on porches or patios. 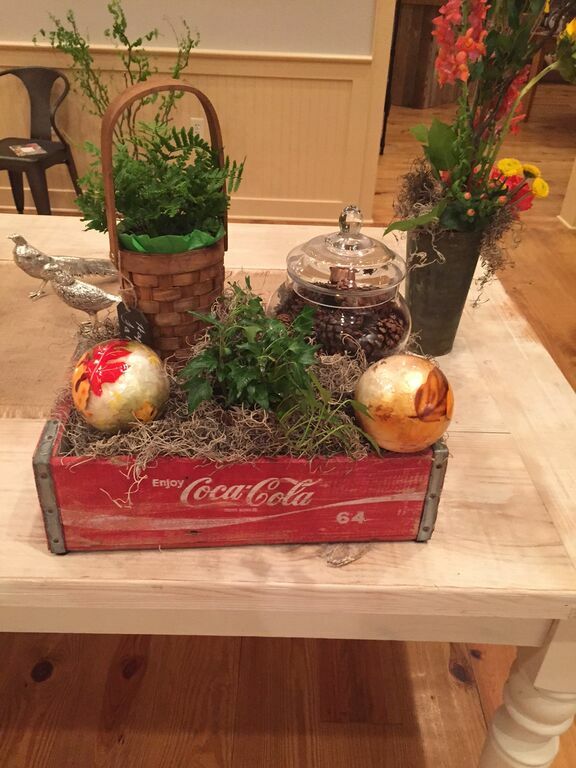 In this arrangement I placed in a few different objects creating a casual, retro vignette. You could also place a few bottles in this create and fill each one with a single stem. I started assembling this pretty arrangement by creating a tape grid on the top of the vase. This enabled me to place stems right where I wanted while keeping them firmly in place. Lots of tall greenery and a bit of curly willow really set the stage for the colorful flowers. It’s all about the colors in this fall place setting. I used my Italian Spode as a backdrop to a simple tablescape. 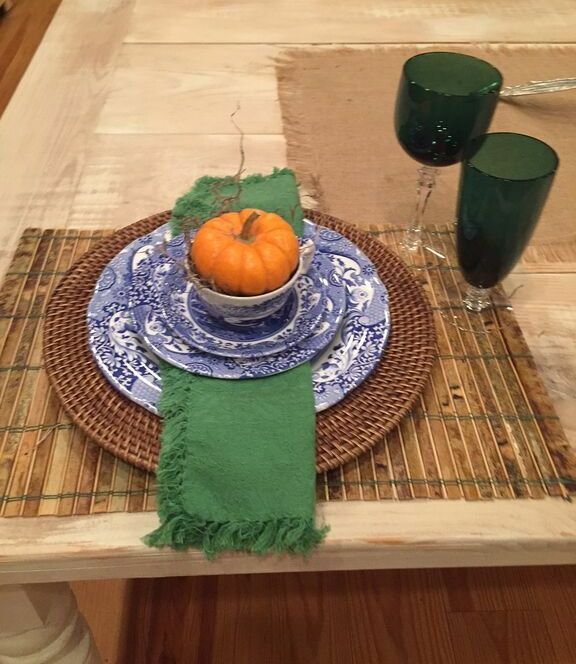 The pops of green from the napkin and orange from the pumpkin really make this inviting. 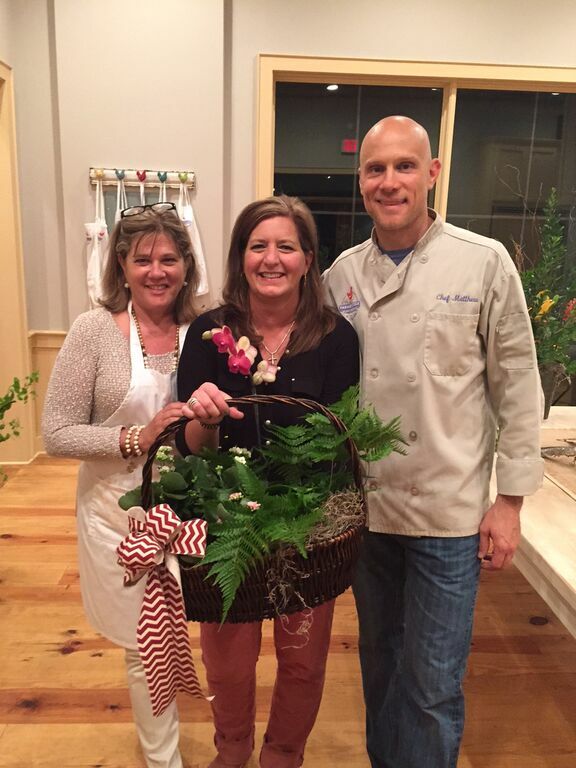 Chef Matthew and Bridget from the cooking school were so much fun to work with and participants were treated to some great food, new recipes and floral design. This made for a very fun evening. I look forward to presenting again at the cooking school. They have done a phenomenal job of creating an environment that seems to brings out the creativity in everyone. What do you think about the arrangements? Would you be likely to try one of these yourself? Do you have any ideas for tailgate, dinner party or seasonal arrangements? Let us know! To leave a comment, click on the title of this blog post and the comment form will appear at the bottom of the page.